TimeZone : Vintage Watches » Election Chronometer. I have been expanding my modest (both in price and quantity) vintage collection of late. I have an Accutron and a 1970's manual wind Cartier Tank but this past few weeks I went on a bit of a splurge! Before Christmas I purchased a 1937 Bulova American Clipper and a Birks Manual wind dress watch (Birks is a high quality jewellery store here in Canada) which was made by Fortis for Birks. But yesterday whilst browsing "the bay" I came across a high rating British seller with a watch that really tugged at my heart strings. A beautiful Election Chronometer. I must admit I know next to nothing about this brand and hence my posting here. Hopefully all your combined knowledge can help me lear a bit more about it. What I do know is that it is a chronometer. The movement has 15 jewels,and is adjusted to three positions and on the dial as well as "Chronometer" there are the words, "Non Magnetic"
I have no idea of the date of the watch but guessing from the size and style I would say late thirties. It is 38mm from fixed wire lug to fixed wire lug and 22mm wide not including the crown. There is some wear on the gold fill on the case back and a little on the bottom side of the case but I love patina, it shows history! The dial looks to my untrained eyes to be original and not restored and very clean for the age. The Case is hinged on the top side and swings open to reveal the movement and dial which by the looks of the pictures can then be taken out whole. It should arrive sometime next week. The seller says it is keeping excellent time and judging by his past feedback it seems his descriptions are accurate. I will post more pictures when it arrives, until then I will leave you with one the seller took. I hope it helps. Thanks so much in advance. 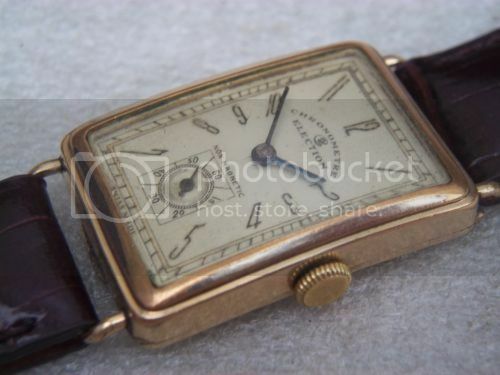 I would love to find out more about this watch and brand and your help would be much appreciated. Next Topic: Boy do I feel dumb - I forgot about the vintage watch forum! !